Chimpanzee Tea Party: Vegetarian Tamales for the 4th? Vegetarian Tamales for the 4th? Thanksgiving holds the crown for "least friendly vegetarian holiday" by a wide, WIDE margin, but certainly the "cookout holidays" are pretty bad as well. In some senses, this problem with cookouts can be even more annoying than turkey filled holidays since people like to grill outside for parties any number of times over the course of the summer... if it's not raining every single freaking day that is (I'm only a little bitter about the weather). While never experimenting with the meatless lifestyle myself, I live with one of those people, and know countless others... and have confronted this issue on multiple occasions and have yet to find a particularly elegant solution, and thus was intrigued by the idea of a vegetarian survival guide. I wouldn't call it much of a guide... it's really just a recipe and its rationale, but the recipe in question strikes me as a particularly good solution to The Cookout Problem. 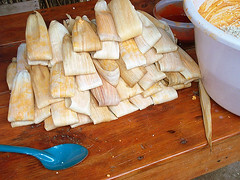 Vegetarian Tamales have the decided advantage over veggie burgers or grilled portobellos in that the part you eat never touches the grill... a point Mr. Fisher only briefly mentions. Maybe in all his focus on sharing and community that he wants vegetarians to embrace for the 4th, he forgot how freaking disgusting most peoples grills are... and I say that as an avowed meat eater and slob. For a vegetarian, getting a section of the grill that is both clean and people promise not to cook burgers on is probably the biggest challenge of the whole deal... and for people who don't know why a vegetarian has to be all huffy about where meat was just cooked, it's not just because "ewwww cow flesh", but because it makes them sick. Regardless, to avoid that whole situation is defintely a stroke of genius. The person cooking the meat won't have to be quite so nervous about where to place everything... the vegetarian won't have to watch the grill like a hawk or wonder if they're going to be getting sick in an hour... and, of course, everybody loves tamalesFREEDOMALES!! While we're not going to any cookouts any time soon, Anna and I have been talking about making tamales for a while now but never settled on recipe... so maybe we'll try this one... though it would have to be scaled down since I don't think we need 20 exactly. Are "Restaurant Weeks" worth it?